It still does not have a proper page in the Wikipedia, but the term exists. Just out of a chatcast or skypecast (link to come soon) of Darren Kuropatwa's presentation at BLC. These are my first thoughts on the experience of being there. The only way I know of making sense out of new things lately. Plunge into technology. So much more to gain than lose. Three vital steps to being there -technically speaking. This is so fast, will I be able to cope? Joining the chatcast late, makes you miss part of it. You just get the updates as from the point you joined in. I had an internal struggle to say thank you or some other emotional responses at the beginning. I repressed it. Priority was to focus on ideas flowing. On a chatcast, be confident they understand you're not being impolite at all. You can send a thank you note/post afterwards; but better not there. So here it goes: THANK YOU. (Sorry for shouting but, I've been repressing for about 41 minutes). Every hit of the chat takes up space and forces the reader to look up, refocus again to catch the thought before your object of attention goes up, gone and out of sight. If it feels like this, we miss the point. Every hit at ENTER, every keystroke, is an attempt to catch people's attention. Literacy implication: handle it with care. Master your fingers. Priority seems to be to let readers focus on ideas and respond enlarging them. Getting ahead somewhere with the brainstorming. Collecting thoughts that will be well worth a post -or a few. I am particularly visual. I must see. I was at Developing Expert Voices on Slideshare and felt a need to know which slide Darren was at. To get into the general idea being addressed at that moment. I imagined the slides would not have a number posted on them so I suggested posting some first words on them. Chris Lehmann helped us out. I wonder how live audio added to the chatcast would change the speed and focus of the comments fetched. Audio from the room. Audience responding by chat only. How many participants could the chatcast hold? All in all, I am surprised to find that speed of delivery and depth of reflections can go hand in hand in a chat environment.Definitely having read each other for a while gives the participants a sense of conversation. A certainty about which topics and questions need to be posed at conferences if they are to take us ahead. I got lost. I could not tell who was there in the room listening to Darren and who were following from a distance. Not that it mattered. I guess being involved makes "a difference". No doubt Darren's presence was energising and inspiring beyond the walls of BLC. I'd like more experiences like this in the future. I'm adding you to my Twitter (http://twitter.com/fceblog). "Good lord that’s some intense back channel chat. And it’s not so much a love for the tools as it is a love for what the tools allow us to do, to experience. It was just one pretty raw learning moment after the next, and it’s a feeling you don’t want to lose." "a large number of educators don't know where their education system foundations lie. Without these foundations teachers can only flail about looking for traction for future ideas. It's vital that we look towards what we can learn and adapt to our own situations and that we get the 'top' educated and understanding why the teachers and students in the frontline want and need certain things - like Skypecasts for lessons for parents to follow lessons, too, from afar. " Stephen points at Doug Noon's post and Ewan's. On the role of the teacher and why buil learning communities. Darren Kuropatwa's post on imagining the possibilites for the future of conferences. "Open it up to the folks who aren't physically there on your twitter and skype networks and you begin to get a sense of what participating in this conference was like. As the presenter speaks pictures are taken, uploaded to flickr and shared within seconds. The speaker says something that a member of the chatcast challenges, finds the source and drops the link into the chatcast. Dean starts streaming the audio live via a skype conference call. Invite students into the chatcast, have the presenter respond to questions in the chatcast as they too participate, and .... it was intoxicating! People from the UK, Canada and the US, who weren't physically there, were there." Tweet your Wish. Beware what you choose ( it may come true). I tweet. I like it. I think it is powerful, particularly for making connections fast. The best part of Twitter is beyond the question about what you are doing. The thing I value about microblogging is that it totally disrupts my way of writing. I tend to think too much around a post. So much that I can even get writtters block. However, on Twitter, I can generally voice the first thing on my mind. Not sure my tweets are diamonds in the rough, but the results may be surprising. Magic. I am the first and only follower added there. For a short time, naturally. I just wanted to capture this screenshot of the empty page saying simply one word. Joined. I imagine many an insightful tweet originating there. You still do not get it? Is it silly? Stop thinking it is about answering just one question. Twitter is not simply about what you are doing. Much rather about what you would like to make happen. 11 July - My RSS- I read this post from Alja Sulčič. The Bloggers' Cafe is born to create more opportunities to join the edublogosphere conversation. The aftermath of the NECC conference -or rather the EdubloggerCon unconference- which showed the power and thrill face to face conversations with the long-read blogger can bring. 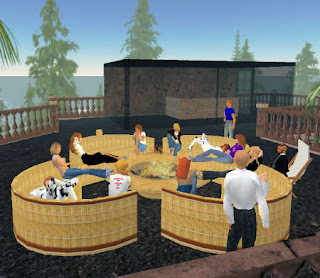 Edubloggers now have a new place to get together in Second Life at the brand new Bloggers Cafe. [...] You can visit the Bloggers Cafe on Eduisland II, on land that was kindly offered by Ryan Bretag (aka Existential Pain). Also, don't forget to join both the SL and the RL group (set up by Jennifer Wagner) and have your blog added to the virtual blogroll at the Cafe. So I joined at the blog and I added the tag TheBloggersCafe to my ELT Notes in del.icio.us. It was tagged back immediately. please consider yourself ALWAYS invited to post. This is the attitude of the Edublogosphere. Open. Welcoming. 13 July -Today, I received an invitation to join the wiki that will archive conversations and show contact details of Cafe members. I added mine. Four hours ago - I already have my user name and password to post. I am already announced at the contributors's page in the blog. Call that fast. Jennifer is a doer. I will certainly hear the question next time I make a presentation. And my answer should be short and simple. Be there. Let it all happen. (I think I'll link this post to the presentation handout as well). Comments will be closed here. I am reposting this entry at the Bloggers' Cafe blog for your thoughts.